Transport for Greater Manchester, in partnership with Stockport Council and the Greater Manchester Combined Authority, are set to submit a planning application for the Stockport Interchange project following a recent four-week public engagement exercise. 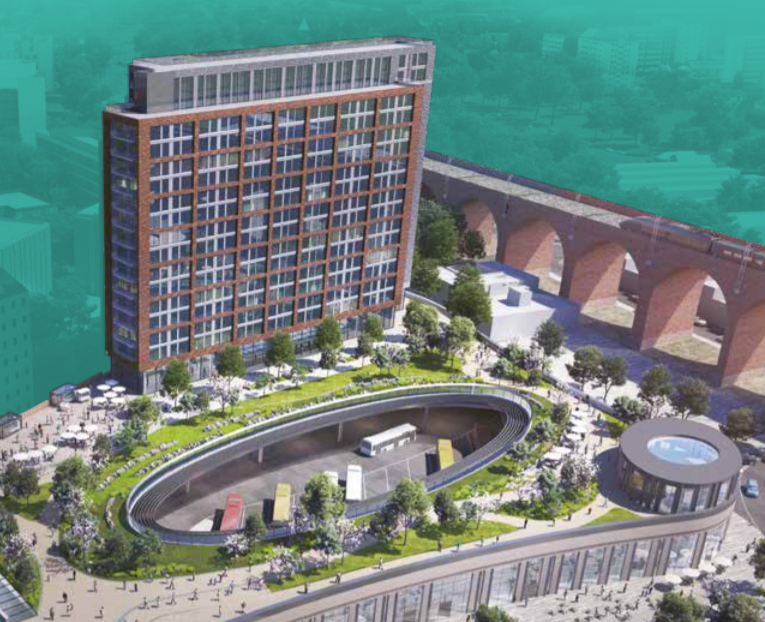 If approved, the project will continue the major £1 billion transformation currently under way in Stockport town centre by delivering a state-of-the-art transport interchange in the heart of the town – also featuring a two-acre public park and high-quality residential development. The public engagement exercise took place in July and gave people the chance to view the proposals and provide us with feedback via an online or printed questionnaire. We received 330 responses from members of the public and Stockport-based organisations. You can view the engagement report online here. The plans were well received, with 72% of those who took part in the survey agreeing that the development would have a positive impact on the town centre. Following careful consideration of all feedback received, the submitted planning application will largely reflect the same design as was proposed in July. However, owing to comments made around the perceived lack of accessibility to the rail station and the height of the residential development, further proposals for a combined cycle and walkway connecting the interchange with Stockport Rail Station will be developed and the height of the proposed residential development has been reduced by around 4 metres. The plan includes a fully accessible, covered passenger concourse with seated waiting areas. Housed within it and bus and train travel information screens, modern bus stands, a lift that connects to the A6, fully accessible toilets complete with baby changing facilities, cycle storage, enhanced CCTV coverage and a brand new Travelshop, will combine to offer passengers with a first-class travel experience. Aesthetically, the new Interchange also promises to make for an eye catching centre piece at the heart of the town. The transformation will see the upgrading of the section of the Trans Pennine Trail alongside the River Mersey, a residential development off Daw Bank with up to 200 apartments and associated car parking – all situated within a new town centre park that’s directly accessible from the A6. The multi-million pound redevelopment of the existing bus station site, alongside the A6 and Mersey Square, is funded by Transport for Greater Manchester (TfGM), Stockport Council and the GMCA, with support from Central Government through the Greater Manchester Local Growth Deal programme. As with the neighbouring Grand Central development, modern edifices look smarter in modern materials – concrete (if rendered or painted) , glass, marble and steel. Methinks the only old material suitable for such to be smooth stonework. Hi Stewart – yes, we made sure it was tram-ready from the start. Can you confirm that the tram stop will be the terminus of the line from East Didsbury? Any tram stop should allow for an eastwards extension also – utilising an old alignment to the west of Brinnington then proceeding northwestwards to Belle Vue, Ashburys and Manchester Piccadilly on the current ‘heavy’ rail network. That line should also extend southeastwards through Brinnington and Romiley to terminate at Marple. Three different Metrolink lines are proposed. Extending the East Didsbury line is one of those. The Stockport Rail Strategy from 2015 has all the info. What’s the use of all these buses/trains Stockport if by then all major shops have disappeared? The most important reason is that thousands of people work in Cheadle and currently drive in. If they have a good alternative – train or tram – then we’ll have fewer cars on our roads, meaning fewer traffic jams, less pollution and not nearly so many parking problems. Of course, making it easier for Cheadle people to get to Stockport, Manchester, London etc. is good too.